SANIBEL ISLAND, FLA. – Wondering where to stay on your Sanibel Island, Florida vacation? Check out Casa Ybel Resort, a staple on Sanibel Island for both newlyweds and families. Room with a view: No need to worry about missing out on an ocean view room as every unit on Casa Yble’s property has a view of the Gulf of Mexico. Each unit faces the gulf and has a screened porch for patrons to enjoy. Recommendation: For those looking for a more serene visit, request the outer units away from the pool. Coconuts: While many resorts have bars located on the grounds, at Casa Ybel you don’t even need to leave the pool! Coconuts is the poolside part located within the resort. Happy hour begins at 3 p.m. and specials include $2.50 drinks, a rare find on the islands. Customer Service: When situated on an island that is as beautiful as Sanibel, there is only so much location gave help you in becoming a top resort, which is why Casa Ybel offers great customer service. Guests rave about quick and easy interactions with members of the staff. Problems are solved fast, and always in a friendly manner. Casa Ybel Resort is located at 2255 West Gulf Drive on Sanibel Island. To make a reservation, or to learn more, visit 239-472-3145. “We take our shelling very seriously,” said Clark Rambo, on Sanibel Island last month with his wife, Pam, who blogs about the hobby. Specimens pour onto the beach, in part because of the area’s geography. By Lizette Alvarez, Published August 7, 2012 in the New York Times. SANIBEL ISLAND, Fla. — The tide is low. The sun crawls toward the ocean for a final dip. The time is here: The hunt is on. Hundreds take to the beach near the lighthouse on this hammock-shaped island, hunching over the sand as they dig, lift, inspect and move on. The position is so common it has a name: the Sanibel Stoop. The beachcombers wave and chitchat but, with their competitive instincts primed, they steer clear of one another’s turf, keeping a sharp eye out for dots or spirals or telltale lumps in the sand. Stretched out as far as the eye can see are shells — large, tiny, cone-shaped, scalloped, spiraled, white, orange, pink. Sanibel Island, and its neighbor, Captiva Island, just off the state’s southwest coast, are where hunters come for a seashell bonanza. There is no other place like it in the country, and very few places like it in the world. On some days, depending on the wind, shells pour onto the beach in piles, seducing even the most jaded beachgoers. This has been particularly true in the weeks since Tropical Storm Debby, the late June storm that caused flooding and beach erosion along some pockets of Florida’s west coast but proved a boon to seashell hunters. Sanibel’s largess is in its geometry: It is a 12-mile barrier island with a distinctive curve. The coastline runs west to east rather than north to south. When storms blow in from the northwest, the waves and currents funnel more than 300 shallow-water species of shells right onto the beach. Other parts of the world, like the South Pacific, may draw more species, but the shells are not nearly as easy to find. They require boat trips and dives. Seashells have proved resilient, too. At a time when fish stocks are down and coral reefs are dying, Mr. Leal said seashells — made by mollusks mostly from the calcium carbonate in seawater — continue to thrive. For some, searching for seashells is a hobby; for others, it is a calling and an obsession that sometimes reaches back generations, with collections passed down like heirlooms. Here, there are shell clubs, shell stores, shell guides, shell excursions, shell crafts and the shell museum. Inside his shell-festooned house, Mr. Rambo holds dear a black-and-white photo of his room as a boy. The image shows his twin bed, spread with seashells mostly scooped from the Jersey Shore. Mrs. Rambo, an artist, also grew up collecting shells, a shared passion that helped cement the couple’s relationship 18 years ago, despite Mr. Rambo’s being injured during a date. It happened during a day of shelling on Sanibel early in the courtship; she pushed him (playfully) as he stood, his feet dug into the wet sand. 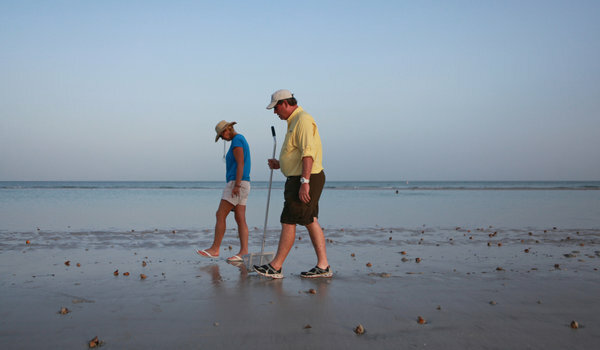 On a recent evening, shell hunters hungrily swept the beach with their eyes. They picked up shells and peered inside them. “Is anybody home in there?” Mrs. Rambo asked. If a mollusk was inside, she placed the shell back on the sand. That is the rule in these parts — no live shelling. Before a 1994 law, people hauled boxes of shells away and began depleting the shoreline. In front of the lighthouse, a teenage boy picked up a starfish and showed it off. A woman from North Carolina dug a hole. She recognized Mrs. Rambo. “I’ve probably found 15 bittersweets,” Denise Kisko, 56, told her, referring to a scallop-shaped shell. She glanced at a 13-year-old girl who was snooping in her spot. “Don’t you find anything in my pile,” she said, kidding, sort of. Competition is stiff. The morning last October that Mrs. Rambo found a precious, elusive junonia, a species of sea snail known for its brown spots, she had told friends to meet her at Blind Pass at sunrise. Hoping to beat the competition, she got there before sunrise, with a light on her hat, to hunt solo. She spotted the junonia in a little trench. It was her eureka moment. Never mind that her husband has found four junonia over his lifetime, a remarkable feat he loves to sprinkle into conversations. After he posted a photo of his fourth junonia online, it proved too much for the shell crowd. “They started booing him on the Web site,” Mrs. Rambo said, with a laugh. Categories: Uncategorized | Tags: Beaches, Sanibel, Sea Shells, Shelling | Permalink. The World War II ship the USS Mohawk was scuttled 28 miles off the coast of Sanibel Island in the early afternoon of Monday July 2nd. It is now an artificial reef for divers and anglers and is a veterans memorial. 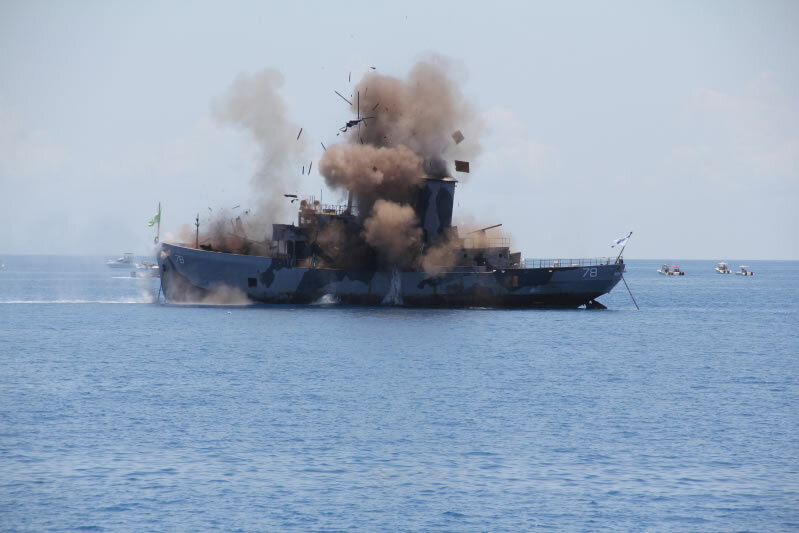 The county’s Marine Services Program and Reefmakers LLC, a Key West company that specializes in sinking ships as artificial reefs, was scheduled to scuttle the 165-foot World War II Coast Guard cutter at 11 a.m., but it was delayed by nearly two hours. Just before 1 p.m., there was a loud explosion, debris flew off the ship and it slowly descended to the bottom of the Gulf. It took just three minutes to sink below the water line. “It’s a big day for us. We’ve done artificial reefs in the past, but we’ve done nothing that was like this. We’ve got the opportunity to take an old historic vessel and give her a final duty that’s fitting of the service that she’s given to this country,” said Steve Boutelle, with Lee County Natural Resources. Joe Weatherby and his team spent two months in Fort Myers Beach preparing the rusted ship, removing hazardous oil and readying her for her final destination. “She’s still got her propellers, she’s still got her guns and her life raft back on board and you never ever, ever see artificial reefs going into the sea looking like this,” Weatherby said. Six charges were placed on the USS Mohawk and detonated at different times, allowing thousands of gallons of water to rush into the ship at once so that it will sit right side up. Sunday morning crews towed the ship to its final destination and anchored it in preparation for the sinking. “They spent a lot of time and a lot of money getting the ship ready environmentally – making sure it’s clean, there’s no oil leaking or any problems with that. The guns were taken off, decommissioned, and put back on. The props were put back on, so from a diver’s perceptive, it’s as if the boat did sink accidentally and it looks like it was operating when it went down,” explained Jeff Miller, President of the Coastal Conservation Association. Similar artificial reef projects have created millions of tourism dollars throughout Florida. The USS Mohawk will make the only artificial reef of its kind in Southwest Florida, and it’s the first to honor veterans. Categories: Uncategorized | Tags: Artificial Reef, Sanibel, USS Mohawk CGC Veterans Memorial Reef | Permalink. Casa Ybel Resort is pleased to announce they have been selected winner in The Knot Best of Weddings 2012 for Knot Florida Magazine and theknot.com. This is the second year Casa Ybel Resort has been voted one of the top Wedding Venues for the west coast of Florida. We would like to thank our wonderful brides and grooms for nominating us for this distinction and we would also like to send a special thank you to our colleagues and service providers for the accomplishment. We look forward to another year of making Sanibel wedding dreams come true. Categories: Casa Ybel Resort, Casa Ybel Weddings, Sanibel Island, Special Event, Thistle Lodge | Permalink. The dean of U.S. travel writers ranks Sanibel Island first among his 10 favorite places to visit — in the world. That’s above the island of Bali and Paris, which are Nos. 2 and 3, respectively, on Arthur Frommer’s list. To be sure, it’s high praise from Frommer, who in 1957 published “Europe on $5 a Day,” which is credited with changing the way a generation of Americans visited Europe.The book launched one of nation’s the biggest lines of travel guides, under Frommer’s name. Tourism promoters in Lee County, not surprisingly, are thrilled about the compliment, and the media and visitor buzz it is creating. “It’s perfect timing,” said Ric Base, president of the Sanibel & Captiva Islands Chamber of Commerce. In a few weeks local tourism’s winter high season kicks in. That’s when demand — and lodging rates — are the highest. Reservations for island lodgings and vacation rentals already are looking very strong, Base said. Frommer’s remarks can help sustain the momentum, according to Base. About a year-and-a-half ago, chamber staff gave Frommer a “behind-the-scenes tour, all over the islands,” Base said, adding that Frommer is a longtime repeat visitor to Sanibel. Frommer’s remarks also appeared in a column he writes, and which a number of newspapers across the country use. Favorable remarks “from a person of Arthur Frommer’s caliber means they will be repeated in a number of media outlets. The reach will just grow and grow,” said Lee Rose, a spokesman for Lee County Visitor & Convention Bureau. This isn’t the only recent accolade from important travel sources. TripAdvisor recently named greater Fort Myers as No. 3 among of the “15 destinations on the rise,” based on a significant increase in user reviews for the area on the travel Web site over the past year. 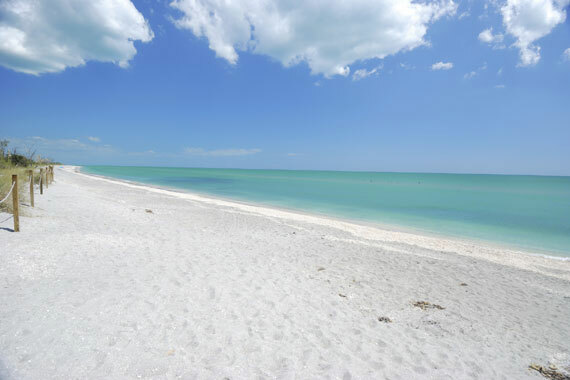 Sanibel and sister island Captiva were also recognized by readers of TripAdvisor when they were named the “Top 25 Beaches in the United States & the World” in TripAdvisor’s Travelers Choice 2011. Some visitors to Lighthouse Beach late Tuesday afternoon didn’t hesitate to add their endorsement of Sanibel. “It’s beautiful,” Jeremy Rosen and Susan Crouch of Pittsburgh said in unison. “We just love the area,” Crouch said. “We are planning on moving down.” She said they learned about the island through word-of-mouth recommendations. St. Louis-area residents Camie and Roy Northcutt said they honeymooned on the island 25 years ago, and have been coming back ever since. Camie Northcutt said she loves the shells, the cleanliness of the beach and the minimal commercialism. 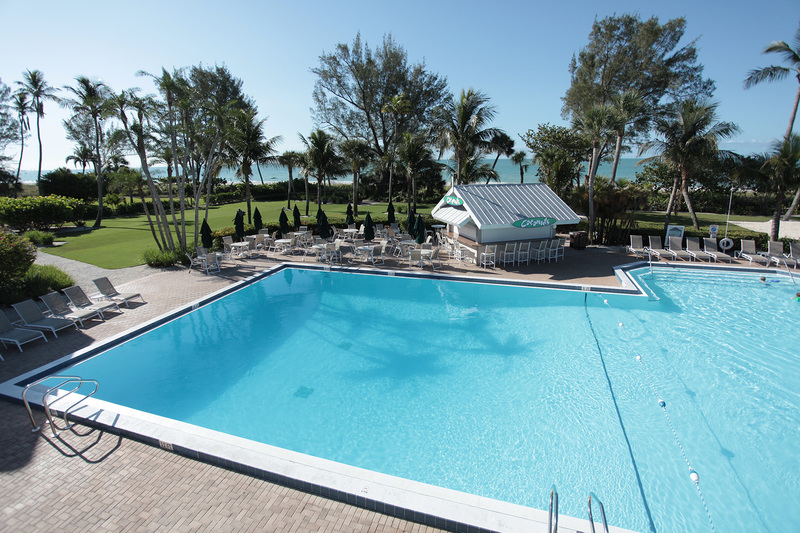 Categories: Casa Ybel Resort, Sanibel Island | Tags: arthur frommer, darling national wildlife refuge, ding darling national wildlife refuge, Florida Resort, Florida travel, island lodgings, professional travel writer | Permalink. Be it ever so humble, there’s no place like home, but sometimes, there’s good reason to brag. While the picturesque paradise that is Sanibel Island is well recognized by anyone who lives or works here, the community may attract a number of new admirers due to the release of several new reports that further herald Sanibel’s status as the most desirous of Florida destinations. In a recent U.S. News & World Report ranking of the eight best beaches in Florida, Sanibel shined as the #1 spot. Neighboring communities like Naples (#2) and Fort Myers (#8) were included on the list. In accompanying text, travel writers said, “You’ll be hard-pressed to find a place in Florida with quieter and clamer shores than Sanibel Island.” Pleasant weather and low-cost lodging venues were credited with making Sanibel enjoyable all year long. Online media attached with the article also paid tribute to area attractions such as Captiva Island, the shops along Periwinkle Way, programs at Big Arts, Bailey-Matthews Shell Museum and J.N. “Ding” Darling National Wildlife Refuge. The multimedia presentation is available on the Internet at www.travel.usnews.com. Bowman’s Beach on Sanibel secured distinction for itself in a Top 10 of Most Secluded Beaches as surveyed by principals of the popular travel website known as “shermanstravel.com. Bowman’s, which is located along a corridor of the San-Cap Road took top honors. It was regarded as a great place to find shells, but not a lot of competition from other shell collectors. TripAdvisor.com, which is reportedly the world’s most widely-used travel-related website, also recently announced their Top 15 U.S. Destinations for 2012. These were determined through a poll of TripAdvisor travelers and editors. Fort Myers, which ranked in 3rd Place, was distinguished among the top vacation hot-spots. The accompanying text, however, regarded Sanibel and Captiva among the area’s top attractions. Of course, Sanibel and Captiva remains first and foremost in the hearts and minds of so many who live here, but such polls have been shown to influence destination choices made by tourists. Given the degree that this community achieves favor in this kind of national reporting, locals may soon see even more visitors with which they can share their love of Sanibel. Categories: Casa Ybel Resort, Sanibel Island | Tags: Casa Ybel, Florida, Florida Beach, Florida Resort, Sanibel, Sanibel Hotel, Sanibel Island | Permalink.